As the sun touched down on the Pacific Ocean, the sense of good, old-fashioned “show biz” was thick in the air on the evening of June 13, 2010. 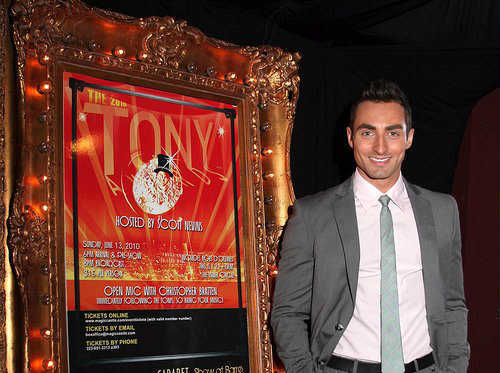 Sure, on the other side of the country, “Broadway” was the place to be as the Theatrical world celebrated the 64th Annual Antoinette Perry Honors (a.k.a. 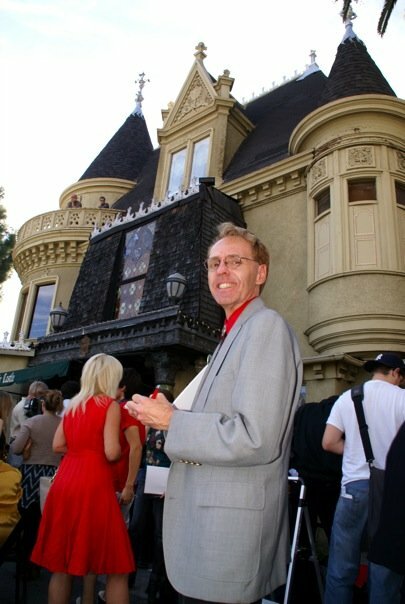 “The Tonys“); but in the ‘City Of Angels‘–a town that knows a thing or two about big, splashy award shows , the occasion was observed at Hollywood’s Magic Castle as it threw open its doors with a party that proved “N.Y.C.” doesn’t have a monopoly on conjuring up a fantastic time. 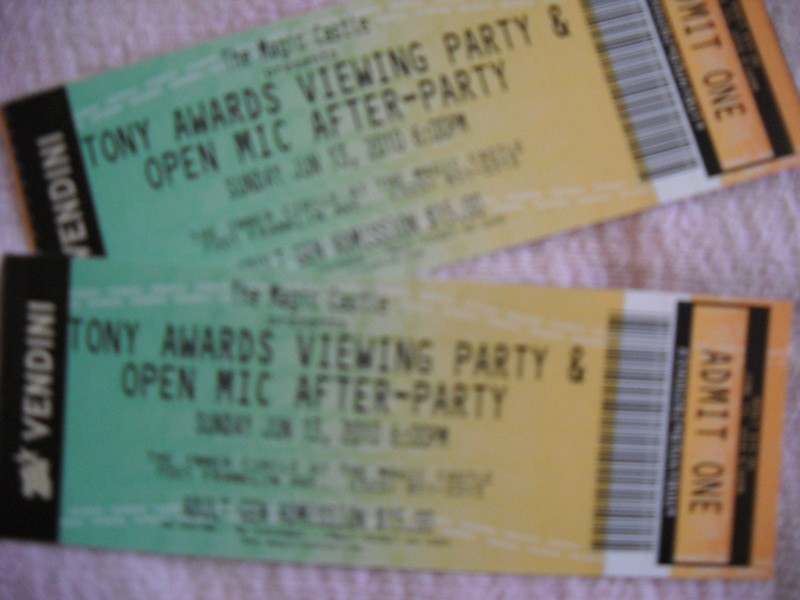 6-13-2010: The Hottest Tickets In Hollywood! Presented by Matt Patton, the creative force behind “Cabaret at the Castle” and Shane Scheel–the Producer at “Show at Barre” (www.showatbarre.com) a nearby stage space specializing in the art of cabaret and musical theater, the festivities began around 6:00 PM when attendees made their way around the side of the palatial landmark to “walk the red carpet”, into the elegant “Inner-circle Ballroom” where the party was held. (Toward the rear of this traditionally decorated ballroom is the “W.C. Fields Bar“–a genuine sight to behold in ivory, gold and blue, which comprises a unique combination of Victorian grandeur and vintage Vaudevillian memorabilia. This is where all kinds of spirituous potations and thirst-quenching brews are served up under the watchful eyes of a grand portrait of the legendary comic. A surprisingly intimate lounge brimming with style, this is also the location of “Cabaret At The Castle”, a regular series that showcases such luminaries as Lee Roy Reams, JoAnne Worley and Katherine Crosby. Yet on this night three copious-sized television monitors took center stage which would allow revelers crisp, clear viewing of the telecast that initiated from the Big Apple’s famed “Radio City Music Hall. Beforehand though, guests were treated to a lite but tantalizing buffet of hors d’oevres and a terrific selection of desserts, including the Castle’s own delectable cupcakes (–one bite is enough to be left completely ‘Bewitched, Bothered & Bewildered’ by their amazing taste and texture!) Meanwhile, classic and sometimes “more inventive” renditions of familiar show tunes, (like Ethel Merman’s notorious “disco’ version of “There’s No Business Like Show Business”,) hummed over the sound system. To add to the fun, each arrival was given their own “ballot” listing the evenings nominees which enabled them to “keep score” against their own personal choices. At 8:00 p.m., the lights were lowered, seats were taken, and all attention turned to those screens–the show was about to begin. “Will And Grace” alum Sean Hayes, himself a “Best Featured Actor In A Musical” hopeful for his headlining role in the first-ever revival of “Promises, Promises”, made for a spot-on host at this year’s proceedings. 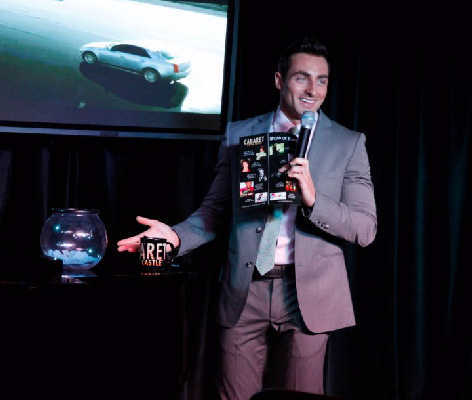 Always funny, engaging and lively, he kept the broadcast moving along swiftly; likewise, over on the opposite coast, Scott Nevins took on Master Of Ceremonies duties. Known for his work on TruTV’s “Smoking Gun Presents”, Nevins is also the host of “Musical Mondays” at Eleven Restaurant And Nightclub in West Hollywood (www.eleven.la) He too, did an exceptional job keeping the laughs flowing during commercial breaks with a few–sometimes candid, sometimes caustic, always hilarious–lines that frequently topped even the broadcast’s official host. One especially clever observation regarding the ‘nature‘ of the male theater enthusiast, took the form of advice to any single gal present hoping to meet eligible men there. (“Sorry ladies, but besides the few married ones brought by their wives, the rest of these guys are probably not interested!”) Another involved the way Catherine Zeta-Jones appeared to be completely taken off guard when her name was announced as “Featured Actress in A Musical” for her work in “A Little Night Music”. (“Consider,” he quipped, ”she now has an Oscar AND a Tony–and both for Musicals!”) Hopefully, this sharp and gifted performer will ‘give his regards to Broadway’, possibly then giving viewers everywhere the a chance to see him shepherding the actual Theater Wing’s annual presentation someday. As for those party-goers here, there’s something enlivening about watching this particular awards program with other like-minded fans and aficionados–from seasoned pros to “up-and-comers” and ‘hope-to-bes” alike. In fact, the entire crowd helped create an electric kind of atmosphere as they cheered their favorites, supported those who didn’t take the prize, and noted the grace (and sometimes gaffes) of the individual winners. In between, there was plenty of opportunity to savor the musical numbers, and offer comments regarding presenter outfits and attitudes, as well as the peculiar way many younger members of Radio City’s audience didn’t always seem to be aware of just how notable others among them (–such as Angela Landsbury and Barbara Cook, for instance) truly were. Special Thanks to Matt Patton, Shane Scheel, Scott Nevins and Lance Perkins for making this article possible; and an Extra-Special ‘Thank You’ to Brian Putnam for the use of his incredible photos. 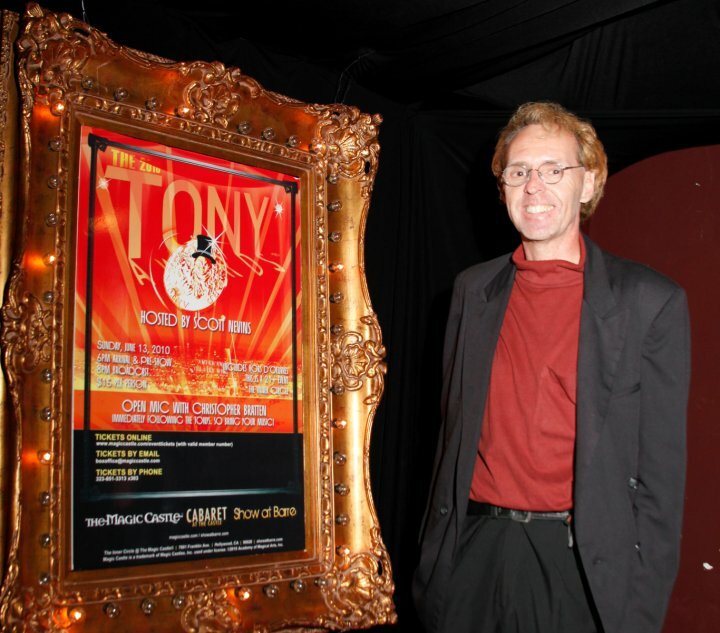 This entry was posted in Ceremonies & Awards and tagged 2010 Tony Awards, Cabaret At The Castle, Hollywood Red Carpet Events, Hollywood's Magic castle, Leo Buck, Matt Patton, Scott nevins, Shane Scheel, Show At Barre, Tony Awards Party. Bookmark the permalink.